α=0 corresponds to the a priori assumption that there is no discordance among gene tree topologies, i.e. that all loci must have the same topology. α=infinity corresponds to the a priori assumption that gene trees are completely independent, as in a consensus approach. 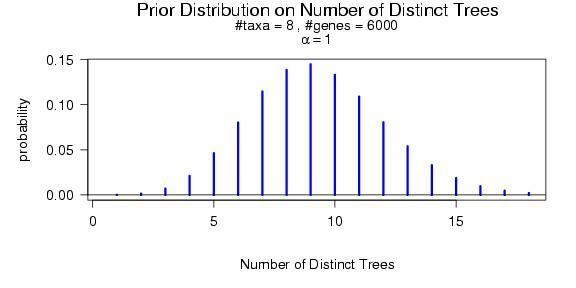 The prior probability that two randomly sampled genes share the same tree is approximately p=1/(α+1) . You can visualize this distribution using R as follows. and replace 8 by the desired number of taxa (ntax), etc.